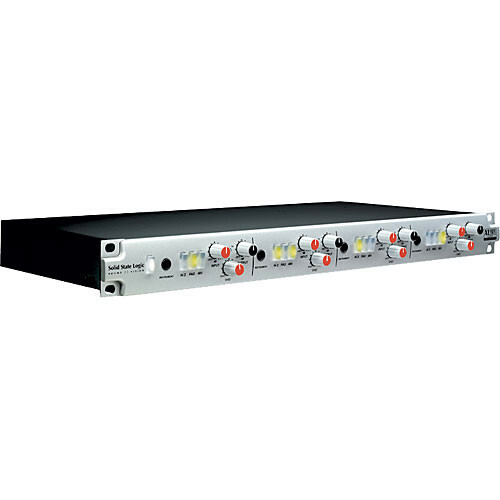 The XLogic Alpha VHD Pre from SSL is a four channel, all analog microphone preamp. Based on SSL's Duende console VHD circuits, the microphone preamp is able to deliver pristine and clear signals. However employing the Variable Harmonic Drive (VHD) circuit, the preamps can infuse the signal with at one end, gentle valve-style warmth, through to trashy, transistor based grunge at the other extreme. The level of the incoming signal affects how the VHD circuit performs, as does a pad button that offers 20dB of gain reduction for loud signals, allowing the preamps to work with line as well as microphone level signals. The VHD control has a far more noticeable effect at higher gain settings and the input gain can thus be used in combination with the VHD control to affect the amount of distortion being added to the input signal. An overdriven preamp may obviously have an effect on the gain of all the parts of the signal chain which follow the unit. An output level control makes adjustment a simple process. XLR input and output connectors are accessible via the rear panel, while four 1/4" instrument inputs are available on the front panel. Individually switchable phantom power is provided on each channel, along with a healthy 75dB of gain. Box Dimensions (LxWxH) 21.4 x 12.4 x 3.3"